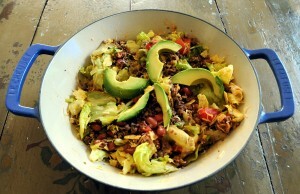 Taco Salad: Love it or hate it? Taco Salad definitely has its supporters and opponents. In my own family, the lines have definitely been drawn. So to appease the group, I now serve the Thousand Island dressing on the side and offer sour cream and salsa as an alternative dressing. Those who like more heat can add chopped green chilies or jalapenos. I’m not sure this is any faster or easy than preparing traditional tacos but it’s a good alternative. Here is the traditional recipe from the 1960s-1970s. A New Mexico version follows. Brown ground beef and onion. (Do not cook red onions). Drain. Mix in taco seasoning and cool slightly. Mix lettuce, tomatoes, kidney beans, raw peppers and cheese. Add cooled ground beef. Add tortilla chips. Add avocado and dressing just before serving. Toss lightly. Besides Thousand Island, other recipes call for Caesar Salad Dressing or Zesty Italian. Okay to skip the dressing and serve salsa on the side. Lettuce that is to go into the refrigerator should first be wrapped in a paper towel rather than a cloth bag. Then the leaves won’t rust. Sauté beef and garlic until beef is browned. Drain. Add green chilies, canned tomatoes, salt and pepper. Mix well. Cool over low heat, uncovered, 30 minutes. Just before serving, arrange lettuce, cheese, chips and green onions in chilled salad bowl. Add meat mixture. Toss lightly. Garnish with sliced tomato. Serve immediately. Combine all ingredients for an oil and vinegar dressing in a screw-top jar. Add an ice cube and shake. Discard the ice cube and your dressing will be extra smooth and well-mixed. Add a tablespoon of boiling water to an envelope of your favorite salad dressing mix, cover and let cool. The flavor is released immediately. Add other ingredients as usual. Do not add salt to a lettuce salad until just before serving. Salt wilts and toughens lettuce.